Be the first to share your favorite memory, photo or story of Hazel . This memorial page is dedicated for family, friends and future generations to celebrate the life of their loved one. 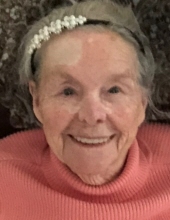 Hazel Hyden, 98 years young, of New Castle, IN, passed away peacefully in her sleep on Sunday, March 24, 2019. Born January 17, 1921 in Happy Valley, TN. Hazel was the daughter of Albert and Martha Boone. Hazel came from a large family with 11 brothers and sisters. She was one of the first of her siblings to leave the family at the age of 17 to start her own life in Indiana. It was in New Castle, Indiana that she met her husband of 37 years. Together they raised four boys. Hazel was a loving wife, mother and grandmother. She enjoyed cooking and gardening. It brought her great joy to care for others. She will be dearly missed. She was preceded in death by her husband, Carl Hyden, sons Joseph Carl and Steven George, as well as 4 brothers and 5 sisters. She is survived by sons Claude Hyden (finance’ Angie), Albert Hyden (Denise) and a sister, Mable Eisenhower of Elgin, South Carolina. Hazel has eleven grandchildren, great and great-great grandchildren, many nieces, nephews, cousins and countless loving family and friends. The family would like to thank Living Petals, Henry County Memorial Hospital, Hickory Creek Health Center and Southern Care Hospice for providing her with quality care. Family and friends may call on Wednesday, March 27, 2017 from 12pm – 2pm at Macer-Hall Funeral Home and Cremation Services. The funeral service will be on Wednesday, March 27, 2019 at 2pm at Macer-Hall Funeral Home and Cremation Services with burial to follow in South Mound Cemetery. Online condolences may be made to www.macerhall.com. Macer-Hall funeral directors are honored to serve the Hyden family. To send flowers or a remembrance gift to the family of Hazel Hyden, please visit our Tribute Store. "Email Address" would like to share the life celebration of Hazel Hyden. Click on the "link" to go to share a favorite memory or leave a condolence message for the family.